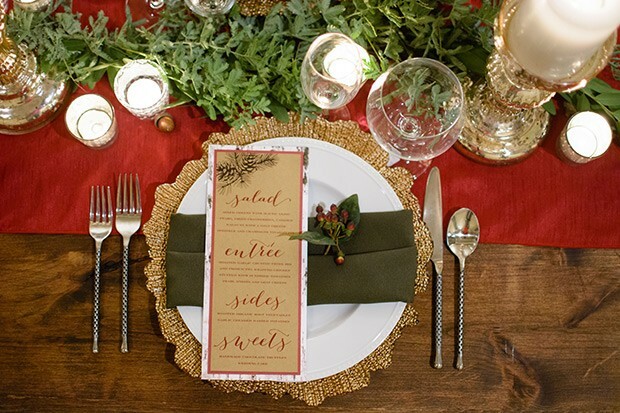 Twelve festive themes and Ideas for winter weddings: Winter is here! And whether you’re having a winter wedding or not, you can still incorporate some of the festive season into your big day. Between food, flowers, dresses and decorations, I’ve listed our favourite Christmas & winter wedding ideas, trends and inspiration, below. Nothing says “cozy winter wedding” like faux fur. You can incorporate the fabric by using blankets out on the terrace, luxury wraps for your bridesmaids or even in your décor—they’ll be perfect for rustic inspired celebrations. If you want to avoid the traditional greens and reds associated with the season, then modern winter options include berry shades such as deep reds and purples paired with winter whites and this seasons favorite – metallic! Everyone loves canape’s – how could they not? Enjoyed grilled cheese and tomato soup shots during your reception to keep guest extra warm & toasty – pun intended! Winter means you can get really creative with your bouquet. Instead of going for fresh flowers, how about introducing, silk flowers, crystals, or even Christmas baubles? We just love the idea of tying your place cards or turning favours to Christmas decorations – you could even hang them on our Christmas tree for an added festive touch. Christmas is the best time of year to splash out on great food and drink, so serve your guests a sharing dessert, the options are endless – Christmas pudding, cheese boards , trifle… our mouths are watering just thinking about it! Wedding wreaths have been more and more popular and are sure to be a must have in 2018! Bet the trends and incorporate wreaths in to any aspect of your décor, they make great table centre pieces or and aisle décor. Greet your guests with a pre ceremony hot chocolate and let gets get comfy prior to the nuptials. Why not create an entire hot chocolate station topped with candy canes, cinnamon stirrers, marshmallows and lots of whipped cream. DIY brides will love this winter frosted theme with pinecone place cards. This arrangement is easy to recreate and looks great on our rustic wooden tables! We think a beautifully decorated Christmas tree is an absolute must. Minimal decorations needed, keep it simple with an abundance of soft fairy lights to give off a classic and chic Christmas tree vibe. Edible items are always a good idea. Go for gingerbread biscuits, sugar cookies or even little mince pies… I’ll have all three please! Hope you’re all feeling wonderfully festive and looking forward to the holidays. Merry Christmas and a here’s to a wedding wonderful 2018! !